Enjoy the very best of this luxury resort when you book one of the all inclusive Cabo San Lucas vacation packages at Villa del Arco Beach Resort & Spa. As one of the best all inclusive resorts in Cabo, you and your travel companions will be on your way to unlimited indulgence. Villa del Arco Beach Resort & Spa is considered one of the best all inclusive resorts in Cabo because it provides travelers with everything they need for an incredible vacation. Those opting for our all inclusive Cabo San Lucas vacation packages can enjoy gourmet meals, a diverse selection of alcoholic and non-alcoholic beverages, in addition to an exciting array of onsite activities guaranteed to make your vacation memorable. In addition, those purchasing our exclusive all inclusive plan can also enjoy the restaurants and bars at Villa del Palmar, a sister resort located right next door. (1:00pm-10:30pm) at Villa del Palmar. (Tues-Sun 6:00-10:00pm) at Villa del Palmar. Villa del Arco Beach Resort & Spa is pleased to offer an international bar to guests who opt for our Cabo San Lucas all inclusive plan. Much more than the common “all inclusive resorts” that offer the bare minimum, Villa del Arco Cabo San Lucas provides a wide variety of of selected liquors, cocktails, beers, and domestic house wine by the glass. In addition, those with a desire for a top shelf margarita or any premium or imported wine, champagne, or liquors can purchase them at any of our restaurants and bars with a 35% discount. For more details about which alcoholic beverages are available with your Cabo all inclusive package, please inquire at the restaurant or bar of your choice as selections may vary. Daily in-room cleaning service, safe deposit box, and a 25% discount on our In-Suite Dining Service. Use of our non–motorized water equipment, such as Kayaks, Paddle Boards, Boogie Boards and snorkelling gear. Please check schedules with our activities staff. Available from 7:00am-10:30pm with delivery fee. To the various pools, beachfront jacuzzis, fitness center, and tennis courts (with reservation). All taxes, services fees, and gratuities are included in the price of your all inclusive Cabo San Lucas vacation packages, however if you feel as though the service you have received deserves additional recognition, extra gratuities are greatly appreciated. When you book your Cabo San Lucas all inclusive package at Villa del Arco Beach Resort & Spa, you’ll be reserving much more than just a spacious suite at a luxury resort. With our all inclusive plan, you’ll have access to a wealth of things to do in Cabo San Lucas, including a myriad of onsite activities, nightly entertainment at Villa del Palmar, our sister resort, and a variety of non-motorized water sports, such as kayaking and paddle boarding on the calm waters right in front of the resort. 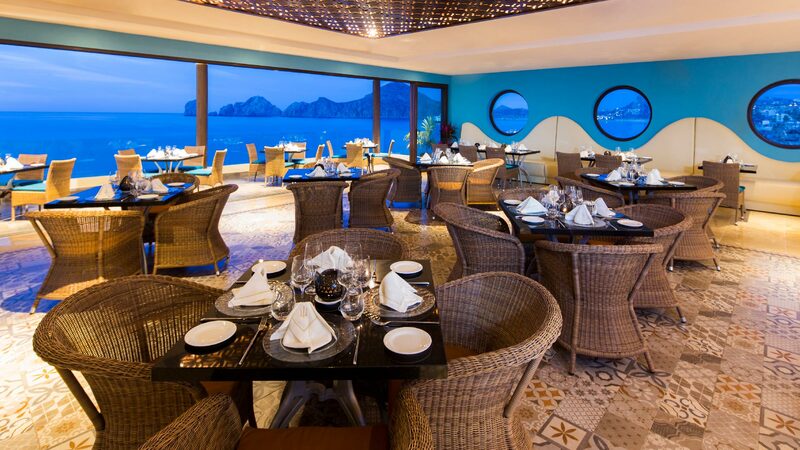 With so much to do at this Cabo San Lucas all inclusive resort, you’ll never find a dull moment on your vacation. Premium Items, such as fine cuts, Angus beef, Lobster and Jumbo Shrimp dishes may be purchased with a 40% discount, however they are not included in the Cabo all inclusive plan. All wine, champagne and premium or imported liquors may be purchased with a 35% discount, however they are not included in our Cabo all inclusive plan. Use of pool facilities at Villa del Palmar & Villa La Estancia (lounge chairs, umbrellas, towels, etc.). In-Villa Dining Service, 25% discount will apply. Palmita Market, Deli, Ice cream parlour, Boutique and La Tienda. Special events in the restaurants such as wine and Tequila tastings, holidays specials, etc., will receive a 40% discount. Kids Club Program and Babysitting Service. Room Services after 10:30 pm is not included. The All Inclusive Plan at Villa del Arco Cabo San Lucas must be purchased for a minimum of 3 consecutive days and must be acquired by every person staying in the room and in your party, including children above the age of 3 years old (3–12 years 50% discount applies). We kindly inform you that the public facilities such as Pools, the Fitness Center, Lounge Chairs, Pool Bar, Beach chairs, & Jacuzzis at Villa La Estancia & Villa del Palmar property are only for owners and guests of those respective resorts (No visitors allowed). Please advise our service staff of your meal plan status before ordering at any of the restaurants at Villa del Arco Cabo San Lucas. Bracelets indicating your choice to partake in our Cabo San Lucas all inclusive vacation packages must be visible and shown at the time of any meal or drink purchase. Please note that at Villa del Arco Cabo San Lucas, we reserve the right to refuse service to overly intoxicated guests or guests observing violations of house rules. Cabo San Lucas all inclusive vacation packages cannot be cancelled or refunded.